This blog would not exist without the Bible of Oliver Cromwell Case. I would have no interest in the 8th Connecticut Volunteer Infantry Regiment apart from the discovery of Oliver’s 1854 Thomas Nelson and Sons King James Bible. Finding this invaluable artifact at a Germantown, Maryland yard sale in 1993 began a quest to know more about this soldier and his regiment that has lasted 19 years. 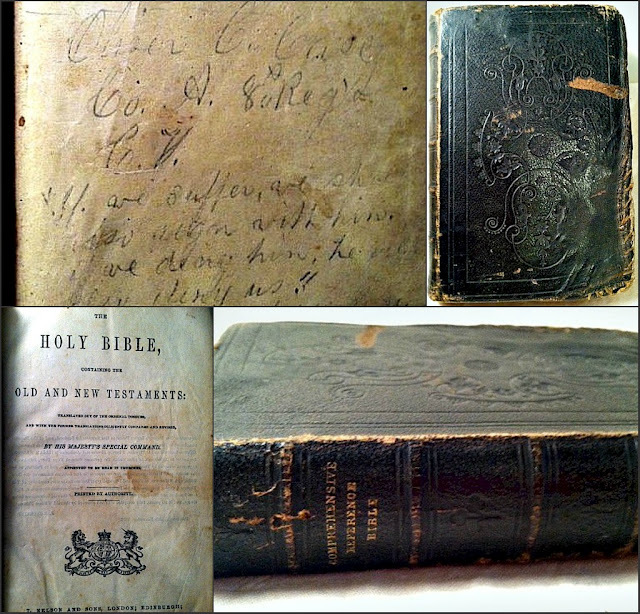 Read more about it on John Bank’s outstanding CW blog (Antietam artifact: Private Oliver Case’s bible). So, how did the Bible get to the yard sale in Germantown and into my hands? Over the past 19 years, I’ve pondered this question over and over again. Here’s my best attempt to explain what might have happened. Plundering was apparently wide spread across the southern end of the battlefield on the night of September 17, 1862 and continued into the next day as the Confederates controlled the terrain where the 8th Connecticut had fought the most intense part of the battle. Oliver had fallen on the high ground just outside of Sharpsburg just prior to Major John Ward leading the isolated regiment to safety back down the hill to the John Otto farm. This leaves scant doubt that the Bible of Oliver Case was likely taken from his body during this period by Confederate soldiers and later left in Maryland. His personal belongings may have been pilfered shortly after the fighting or the following day by the Confederates who retook this ground upon which the 8th fought so bravely. I believe Case’s Bible was likely taken by a Confederate soldier who later traded it for food or other items to someone living in or around Sharpsburg. If the Bible been present on his person when his brothers found Oliver’s body two days later, they would have kept it for the family. From Sharpsburg, it somehow found its way to a yard sale in Germantown, Maryland in 1993. It is also possible that Oliver dropped it on the far side of the Antietam Creek on the 16th or 17th of September to be found later by a citizen of the area. It could have also been dropped somewhere along the route of march from Washington and later made its way to nearby Germantown. However, the excellent condition of Bible tends to support the former scenario. No matter the journey and circumstances, I remain thankful that 19 years ago, I found it and now have the privilege to tell Oliver’s story.